After the debacle in the Saltlands, Farlaine the Goblin escapes to another magical land on his relentless search to find a home. After two issues of mostly solo journeying, however, he’s brought a friend along: a lovable “Tink” robot who’s confident enough to challenge Farlaine’s reasoning — and offer readers a decoder ring to this ever-changing universe. 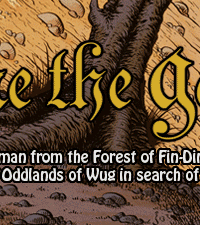 Farlaine the Goblin has spent years wandering the very many Oddlands of Wug in search of a forest to call his own. He only has 8 lands left. The Racelands is the next stop, a land where you can race anything from shoelace tying to dictionary dictating! And there appears to be one race promising a forest as a prize! 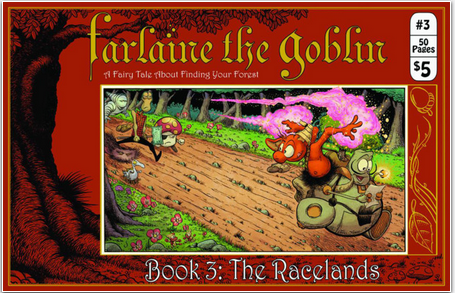 For those of you who’ve been following this series, you’ve no doubt already familiarized yourself with it’s unique premise: Farlaine is a tree goblin who wields powers similar to Swamp Thing, navigates kingdoms reminiscent of Willingham’s Fables, and encounters villains (and allies) that you’d only expect to find getting sauced at the Creature Cantina. Most impressive, this is self-published book from an anonymous creator who seems to be pouring his heart and soul into these pages. But unlike your buddy who always talks about making comics but never will, Farlaine is the real deal — and with issue #3 we see another massive leap forward in both art and storytelling. Just three issues in, there already seems to be a formula developing here — Farlaine arrives at a new land, we spend a few pages acclimating to the rules of this new place, and then the jump into whatever adventure this new ecosystem has in store. Issue #3 is no exception and the adventure is this: a race with Farlaine and his sidekick Tink on one side, and a motley crew of otherworldly creatures on the other. The writing is satisfying, the humor subtle, and the story tight — it’s also helpful to that the creator turned Farlaine’s original one-man show into a buddy book (at least for issue #3). This allows Farlaine to explain how traveling between the Oddlands works in a way that doesn’t feel forced. With his new round sidekick, it’s hard not to make parallels between Farlaine’s quest and that of Don Quixote — both are chasing windmills, and get held back (and anchored) by their pragmatic sidekicks. The only inherent risk to this series is that (so far) each book requires set-up as the title character enters each new land; the narrative momentum takes a while to build as a result, even if the end result is enjoyable. The most engaging aspect of issue #3 is the art — the panels are rich with detail and really play with the fact we’ve entered a different universe. I often found myself lingering on the pages just to catch all that the creator had done. Overall, I continue to be impressed with this series — it offers a sweet, rich, and imaginative universe. There’s definitely something special going on here. Go grab a copy and see for yourself.